The following was posted by me a few years back, though here it is expanded and edited slightly from that original post. This is the season once again to reflect on the sacred mysteries of Holy Week and Pascha. I suggest we work backwards from the Resurrection. If Jesus had died on the cross and that was the end of his life, what would his legacy have been? Not much, I suggest. A paragraph, perhaps, in the history of impact-making rabbis of Israel under the Romans, mentioning some notable healings and memorable insights into the rule of God in the world. Maybe today scholars of Judaism would produce a monograph or two on ancient magicians among the rabbis, notably Jeshua ben Joseph. Perhaps there would be a brief headline-making news item that the Teacher of Righteousness at Qumran had been identified by an unusually radical scholar of the Dead Sea Scrolls as that same Jeshua ben Joseph. That is why, to offer a first reflection this Resurrection Week first week of Eastertide), the question of the witness to the resurrection is vital to Christianity. Deny the resurrection and everything about our claims to truth falls over. Personally I find the variations between the gospels, 1 Corinthians 15 and, say, Acts 10:34-43 puzzling. Why isn't the account of that collective written witness, bound in the one New Testament, more consistent? Modern skeptics have driven a horse and cart full of doubts through the lack of consistency (even, some might say, "actual inconsistency if not downright contradiction"). Yet closer inspection yields more consistency than some are prepared to allow. At the bedrock of each gospel narrative is the empty tomb. They are consistent on the fact that the crucified body of Jesus was placed in the tomb, on the third day the tomb was empty, and thereafter the risen (i.e. raised up from the tomb) Jesus appeared to people. So also 1 Corinthians 15:4-5, 'he was raised on the third day in accordance with the scriptures, and that he appeared to Cephas, then to the twelve'. If the tomb was not empty why mention the act of raising from the dead and not proceed straight to the accounts of the appearances of Jesus? First and foremost, Jesus appeared on a number of occasions to a range of witnesses. Between the four gospel writers and Paul's 'tradition' account in 1 Corinthians 15 we receive a set of accounts with heavy selection at work. Paul's tradition is focused on the appearances to the leadership of the Jesus movement, with the exception of the appearance to 'more than five hundred brothers and sisters at one time'. The four gospels uniformly emphasise the immediate witnesses to the resurrection, women. Matthew, Mark and Luke (distinct from Acts 1) move quickly from the immediate experience of the risen Jesus to his departure (albeit somewhat implicitly in Mark). Only Acts 1 and John 21 imply a period of more than a few days or weeks in which Jesus remained with his disciples. Together these witnesses to the variety of Jesus' appearances do not provide anything like a coherent account of the history of Jesus between resurrection and ascension. That, perhaps, leads us to a second reason for the variations between accounts. Secondly, the gospel writers in their gospels are focused on providing for their readers an account of the ordinary human life of Jesus, prior to death. The continuing presence of the risen Jesus in his ongoing movement, via the Holy Spirit, perhaps made unnecessary a prolonged account of the period between resurrection and ascension. (Luke, in his 'sequel' to the life of Jesus unveils in Acts many ways in which the risen Jesus post-ascension continues to engage with the movement). What their accounts needed was a wrap up and what we find is that the accounts of the resurrection are overlaid with conclusions to the gospels as a whole (or, in the case of Mark 16:1-8, we might say, denuded of a conclusion via intentional abruptness in the closing of the account - a kind of anti-conclusion). John works in a different manner, having proposed through his gospel that everything is going on all at once ("my hour"): death and departure, cross and glory, descent and ascent. Thus his Pentecost occurs on the day of Resurrection but there is a epilogue or two as a week elapses before the appearance to Thomas and further time before the appearance to the disciples at the Sea of Tiberias. But, like his evangelical colleagues, John is always wrapping up his gospel through the last chapter of the narrative (20) and through the epilogue to the main narrative (21): so there is a closing word to skeptics among the believers via the encounter with Thomas, then there is a word, via John 21, to Christian groups divided over leadership of the church as the first century comes to a close. My own Epilogue to this post: I am fascinated by what - after many years of study - still strikes me afresh from familiar scriptures. In this case, preparing to preach from John 20:1-18, the three occasions in which Mary fixes on the explanation for the empty tomb that the body of Jesus has been removed by a group of people (20:2, 13, 15). I had not previously noticed that this is a threefold "fixation" of Mary. On the one hand Mary is being reasonable: if the tomb Jesus was buried in was one found at short notice, then it likely was temporary, and thus some expectation of him being moved to a permanent tomb. On the other hand, through repetition, John the narrator shows that he is aware that there are various explanations for a tomb devoid of the body which was placed in it. (Matthew 28 provides another one: that the body has been stolen, rather than intentionally placed elsewhere by those who care for Jesus). Thus the narration John provides is an assertion of a contrary possibility: the tomb was empty, the grave clothes were found folded in a certain manner, because the "impossible" had happened, Jesus' body was raised to new, resurrection life. But theologically John is also making another point: the resurrection is about what we see and are prepared to believe. Mary keeps seeing the empty tomb and believing the explanation is quite humanly ordinary: the body has been moved to another tomb. Even when she sees Jesus, she does not see him but believes she is seeing the gardener; and the gardener, surely, knows what has happened to the body. Jesus both invites and provokes Mary to see differently and thus to believe differently. With one word, her name, he alters her perception. She sees Jesus, not the gardener. She believes he has been raised from the dead. And critical to the transformation of her sight and her belief is the intervention of Jesus: he creates belief in her. Implicitly, John is saying to his readers, perhaps some six to seven decades after the death of Jesus: you do not need to have experienced the physical or "physical" Jesus for yourself: even if you had, you might not have recognised Jesus. Mary did not. What you need is to be brought to faith in Jesus as risen and eternally alive to God and to you. And this gift of faith comes from the risen Jesus himself and is available to all whom he calls by name. Explicitly this is also brought out in the encounter with "doubting" Thomas: Blessed are those who have not seen me, yet believe in me (20:29). Of course this is not so good for "apologetics" to the extent that apologetics works hard to prove that Jesus was raised from the dead as an historical fact and thus we ought to believe in Jesus as the one who is vindicated by God through resurrection as the Son of God, as the Saviour of the world. This is much more "existential" and a bit tautological: I believe Jesus was raised from the dead because the living (raised) Jesus has met me and called me to him self. Apologetics is important! So is a lively regard for existential encounter with the risen Christ! I need to be realistic. I am not going to get a second post in a proposed series on Islam out this week. Possibly not next week either, but I will have time to do some reading next week in preparation for post number 2, perhaps on Monday 29 April. Meantime, it is Holy Week, and, very sadly, as I write, there is news of Notre Dame, Paris, on fire - and a huge fire at that. An amazing cathedral and one I was privileged to visit in 2015. But there is also a sense in which the world of religion is on fire this week. Particularly Down Under where Israel Folau, gifted and prodigious Australian rugby player, has just been sacked by Rugby Australia. Their grounds for sacking focuses on a breach of code of conduct in respect of social media postings (and, on the face of it, having given Folau a huge break a year ago when he cause significant controversy, they are right to sack him on these grounds because he has defied RA as his employer). But what he Tweeted - about various kinds of sinners, including homosexuals, going to hell - has caused offence and brought on widespread condemnation across Australian and New Zealand mainstream and social media, while simultaneously raising further debate about free speech versus hate speech. For different Christian responses, from significant Australian Christian voices, read David Ould and Brian Houston. I think it reasonable to say that whatever Israel Folau thought he was doing, he didn't think deeply enough about what helps the whole Christian cause Down Under in respect of preaching the gospel of grace. Here in Aotearoa NZ, many Christians, arguably even over 90% of Christians, are on fire because of a bill bearing down upon us which would legalise euthanasia. Except the bill is messy and ambiguous and seems to offer some kind of "on a wing and a prayer" approach to future termination of life. Our parliament has done wonderfully well, with great efficiency, in passing a gun control bill in record time. It must do good and not bad on this matter of euthanasia! Finally, social media is no place to debate the intricacies of religion is my "conclusion of the week." It is a bear pit in which speech becomes a form of shouting, all too quickly. 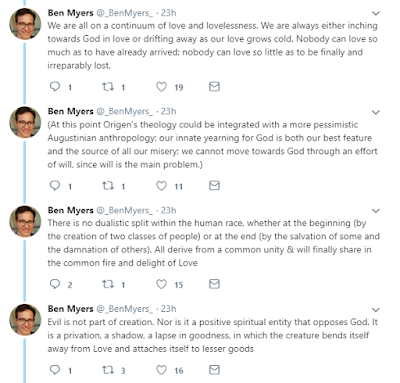 But yesterday I came across a wonderful thread which summarises the theology of Origen, including his extraordinary vision for the universality of divine love. 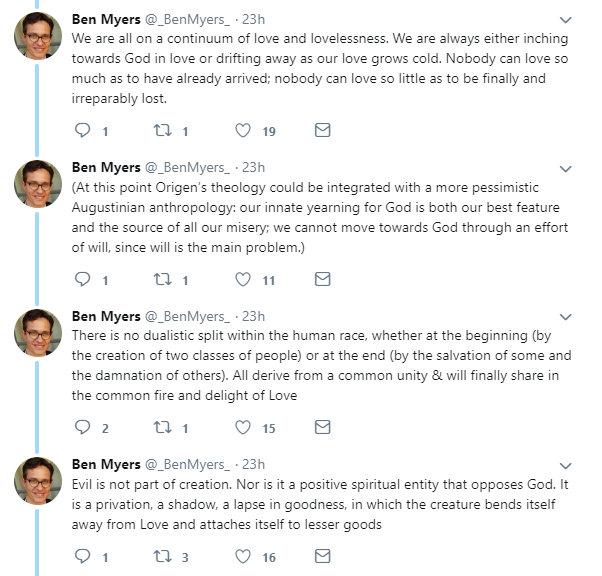 The thread is not only wonderful for its summarising power, but also for its recognition of how Origen's theology necessarily must engage with Augustine's. Following up some requests here and there for basic information etc re Islam, following the terrible events of 15 March 2019, it seems practicable, at least regards time, for me to devote a few weekly posts to Islam and my understanding of it. Post number 1, today, proceeds from a question about "God" according to Judaism, Christianity and Islam. Is it the same God? This is a fraught question because whether we answer Yes or No, there are ramifications! "Yes, it is the same God" feeds the great and attractive myth of modern, Western secularism, that all religions are the same, and why can we not all get along, e.g. making cathedrals into inter faith venues. "No, it is not the same 'God'" feeds - potentially tragically - into the clash of religions, if not civilizations, nations and races, because it fosters difference in society, especially in societies in which there is not a settled state of respect and reconciliation between races, religions, nations. The kind of difference, now experienced sadly in Christchurch, wherein a "white supremacist" feels emboldened to massacre Muslims. The fact of the matter is that there is no easy, straightforward answer. 2. Yes, all three faiths are monotheistic, affirming that there is only one God, that God is one (indivisible), and that the one God is God of everything (the whole universe, or, if you will, multiverse). That is, not only do the three faiths deny that other gods exist, they also deny that the God they worship is in any sense merely nationalistic (God of Israel) or tribal (God of the Arabs ... or of Englishmen). 4. No, the three faiths do not agree on what they believe about the God of Abraham. In particular, neither Judaism nor Islam accepts the Christian claim that the fullest revelation of God is found in Jesus Christ, that consequentially God is believed to be One-yet-Three, Father, Son, Holy Spirit. That is, when we move beyond the bare name, "God", beyond the bare claim, that God is One (without rival, indivisible), into description of God, our understanding of "who" God is, which is also a claim about "how" God relates to us and us to God, then there are significant differences between the three Abrahamic faiths. That is, the answer to the question at the beginning of the post is, "Yes and No." But could we also say the "Yes" is very important? When we emphasise the "Yes" we are open to finding what we have in common, to seeing the points of respective theologies which we can unite around, and generally to appreciating what each faith might teach the others about the Godness of God. Is Islam to be loved or feared? - since 15 March 2019, every contact I have had with a Muslim in Christchurch has been a connection with a person full of love, compassion, and genuine commitment to peace, unity and community well-being. - last week, not that far from NZ, in global terms, the Sultan of Brunei instituted the death penalty for homosexuals and adulterers, as an expression of his commitment to instituting Sharia, the somewhat tough edge of Islamic law. The least we can say and do is to love Muslims! Still lots of comment washing around the world, mainstream and social media, about the terrorist attack on mosques in Christchurch on Friday 15 March 2019. Here I will add a tiny amount. (1) A Christian theological account of what has happened enables us to resolutely call what has happened evil and to acknowledge that evil perpetrated through human choice is a tragic fact of human life. A tragic fact made possible by freedom to choose good or evil being a mark of and gift to humanity as created by God. Thus I am less than tempted to side with those commentators who wish to apportion responsibility to loads of other people, whether, say, to white European New Zealanders who have not completely solved racism in these islands, or to alleged deficiency in our intelligence services. (2) Nevertheless, and with yesterday's RCL readings in mind, Isaiah 55:1-9/Luke 13:1-9, focusing on repentance, it would be escaping the accountability of this moment in history to not take the opportunity to repent of what the terrorism highlights: (e.g.) everyday, structural racism in our country; Islamophobia; lack of inclusion of migrant communities in our society. In Christian terms, have we loved our neighbours as ourselves? I cannot speak for you but for myself I see much to repent of. "Allah is the greatest. Allah is the greatest. Allah is the greatest. Allah is the greatest. I witness that there is no god but Allah. I witness that there is no god but Allah. I witness that Muhammad is Allah's Messenger. I witness that Muhammad is Allah's Messenger. Come to the prayer! Come to the prayer! Come to the salvation! Come to the salvation! Allah is the greatest. Allah is the greatest. There is no god but Allah." Wasn't 2 mins of silence, and /or the National Anthem enough?The Christchurch Diocese and it's bishop have, in the eyes of Islam, become Dhimmis, and in the eyes of other Christians, become Apostate." There is, of course, no neutrality between Christians and Muslims on the matter of what we believe about Christ and Mohammed. Each respects the other faith as distinctive, different and in disagreement. By contrast, I am confident that the underlying presupposition of much media reporting and comment this week is that "all religions are the same." Nevertheless, I think what Bishop Brian said was tone deaf to a tragedy of global reverberations and that Christians supporting Muslims in a respectful way through these days and weeks of grief is the right thing to do. As best I understand, many if not most Christian leaders in NZ this week share the latter approach and not the Tamaki approach. The gunman makes no claim (so I understand) to be Christian - thankfully - but once he started shooting with a gun bearing names on it of European leaders in past Christian-Muslim battles, Christians lost the right to claim control of the narrative of the subsequent course of events. If the devil is winning a spiritual battle for NZ at this time, it is due to 50 people being killed by a terrorist, not to Christians leaders supporting Muslim communities as the least we can do in order to love our neighbours as ourselves. Sometimes a picture says it all, here. Every reader here at ADU will know that a few days ago, on Friday 15 March 2019, a terrorist, in the name of white supremacy, carried out a deadly plan to shoot people at two mosques in Christchurch. 50 people died, over thirty more were injured. Every news outlet in t he world has carried the story and countless words have been written about the meaning of this event. No further words are needed from me here. I have, however, said a few words in my capacity as Bishop of Christchurch, both to the Diocese and to whomever might be listening to several different radio stations. A few comments have been made on the previous post’s comment thread. You are welcome to comment here. Millions are praying for us around the world. Keep praying. Especially for those who are receiving the bodies of their loved ones around now, having been at last released by the coroner, to be buried as soon as possible, according to Muslim custom, and pray for those who continue to sit with loved ones recovering from wounds. For many citizens, maybe even all of Christchurch, and beyond, this tragedy has awakened grief and fear triggered by the quakes. Pray for us that healing and peace will come to a community already with heightened mental health statistics. And pray please for those people who have seen and been traumatised by the terrible video posted by the gunman as he went about his dastardly deed. It has been my privilege to be in Suva, Fiji this weekend, for the ordination of Fereimi Cama as bishop and for his installation as Bishop of Polynesia and thus his formal recognition as Archbishop of Polynesia and thus one of our three Primates. All three events took place within a single, two and a quarter hour service. I am in that circle (left hand bottom corner of the circle). There are a lot of bishops - it was a very good turnout of our bishops, along with a bishop from Australia. What does the photo not tell us? 1. It was a very warm and humid in the cathedral - notwithstanding a great array of electric fans. I needed a shower between the service and the festivities which followed. 2. 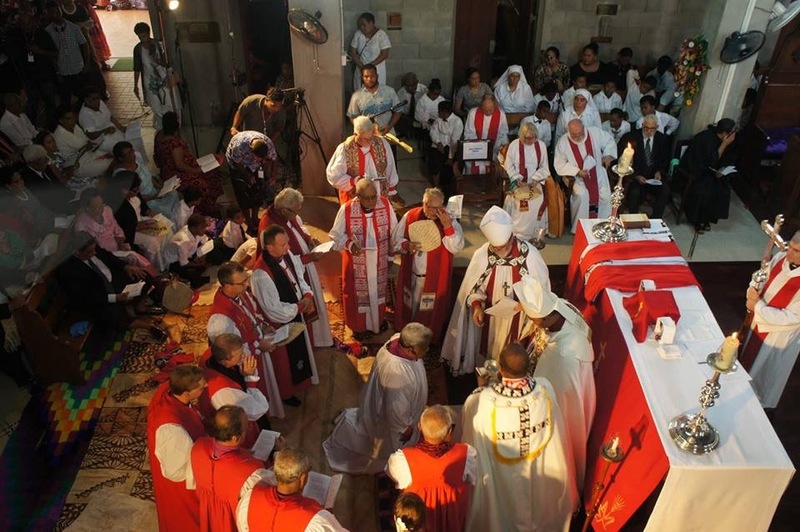 This was an event in the life of our church with international interest: the service began with greetings from the Anglican Church of Australia, the Diocese of Lincoln (a companion diocese) and the Archbishop of Canterbury, and the Episcopal Church of the United States of America. 3. Archbishop Fereimi is the first Fijian Bishop of Polynesia which has its cathedral and diocesan headquarters in Suva, Fiji. His six predecessors have been of European descent (the first four), then respectively Samoan and Tongan. Having been invited to reflect on this proposal, after dipping into the book cited from above, I am left underwhelmed. Before we get to the underwhelming of me, let me underline the great strength of Canonical Theism: it joins with movements in theology, past and present, in which we the church are reminded and renewed by re-acquaintance with the riches of the past. Christianity is now historically old and it is highly probable that few issues and question of today were not addressed in the past and so ... why reinvent the wheel? 1. Canonical Theism - in itself, as a conception of how the church might refresh its life and mission through retrieval from its heritage - offers no ability for the church to discern what is unhelpful, unhealthy and uncongenial from its canonical heritage. Lurking in our canonical heritage, for example, are some appalling attitudes to women, expressed in writing by some of the same saints that, otherwise, are properly lauded for their contribution to theology and liturgy. Our criteria today for rejecting those appalling attitudes of yesterday are not informed by Canonical Theism. 2. While it is true, as I mentioned above, that there are few issues and questions today that were not addressed in the past, the fact is that there are a few issues and questions today that were not addressed in the past, and thus Canonical Theism is of limited value in addressing the sharp edges in the contours of modern Christian life. Take, again, a matter concerning Christian women. Even if there were no appalling attitudes to women among the ancient Fathers, we could not get from those venerable men a positive steer on the ordination of women. Yet many of us - valuing though we do, what is good about our canonical heritage - think we are not bound by that same heritage to refuse the ordination of women. That is, there are, notwithstanding the attractions of talking about the blessings of the Holy Spirit for the church today by reacquainting ourselves with yesterday, significant limitations in the proposal called Canonical Theism. The Holy Spirit continues to bless us, of course! But the blessing of the Holy Spirit in the life of the church today is the blessing which comes from hearing what the Spirit is saying to the church, and what the Spirit says to the church today is not bound by the limitations of Canonical Theism. This will be my last "provocative" post till after Easter. In a Lenten fast I will post weekly in as anodyne way as possible, eager that no one comments - your Lenten fast! - but also, being honest, I have another writing project to complete before the end of March, and there is a bit of travel coming up, and ... well, Easter creates its own episcopal deadlines re my workload.